The outlook for global trade cooperation is darkening. Amid the sluggish recovery from the global financial crisis of 2008-09, trade and globalization have in many advanced economies become lightning rods for public anxiety over diminished economic prospects, rapid technological change, immigration and more broadly discomfort with the pace of social change. In these countries, the social licence on which open markets rest has become fragile. The result: sustained pressure on the international economic system that has underpinned seven decades of peace and unprecedented prosperity. We today run the risk of shifting from a rules-based trading system to one based on deals and power politics. Some of the anti-trade sentiment is the result of rising wealth inequality and stagnating real wages. Policy and business elites did not speak frankly about the unequal distribution of benefits from trade, and failed to adequately accompany market-opening with good domestic policies to equip displaced workers to upskill, adjust and share in the new opportunities being created. 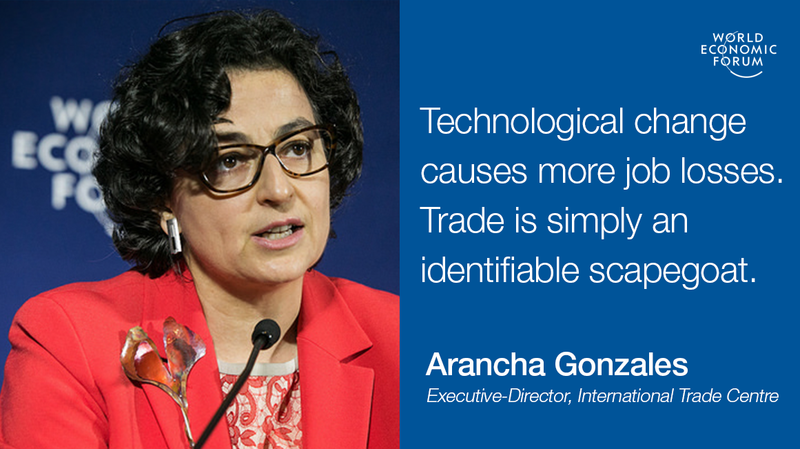 Yet technological change is responsible for far more of the job losses than imports of goods and services: trade has simply become a more identifiable scapegoat. However unpopular trade may be in some quarters, the fact is that trade does improve productivity and growth in aggregate. If governments start to go it alone on trade, it will become harder, not easier, to generate the jobs and rising incomes that angry electorates want. Inward-looking unilateral trade policies invite retaliation. The open global economy has enabled the largest-ever reduction of extreme poverty. Closing markets would close off prospects for poor countries to trade their way out of poverty. And the singular lesson of the 1930s is that zero-sum approaches to economic relations lead to trade wars, economic stagnation and, ultimately, conflict. A World Economic Forum council focusing on the future of international trade has identified three potential scenarios for how the upcoming years might unfold. Borrowing from Sergio Leone, we call them “the good, the bad and the ugly”. The risks are firmly on the downside, but it is not too late for governments, businesses and civil society to work together to arrest the slide: to choose reason over friction, cooperation over conflict, and multilateralism over unilateralism. Responsive and responsible trade and investment policies are possible, but it will take hard work at home and in the global arena.